2014 Mitty Challenge by HSR at Road Atlanta Road Course, Braselton GA.
2013 Mitty Challenge by HSR at Road Atlanta Road Course, Braselton GA.
2012 Prodfest by SCCA at Virginia International Raceway, Alton VA.
2012 Mitty Challenge by HSR at Road Atlanta Road Course, Braselton GA.
2011 Prodfest by SCCA at Virginia International Raceway, Alton VA.
2011 Vintage Grand Prix by VARA at BeaveRun Motorsports, Wampum PA.
2011 Double Regional by SCCA at Carolina Motorsports Park, Kershaw SC. 2011 Mitty Challenge by HSR at Road Atlanta Road Course, Braselton GA.
2010 Mitty Challenge by HSR at Road Atlanta Road Course, Braselton GA.
2010 Buck Muse Double by SCCA at Carolina Motorsports Park, Kershaw, SC. 2009 Eagles Nest Hill Climb by SCCA at Banner Elk, NC. 2009 Time Trial by NECC at Beave Run Motorsports, Wampum PA.
2009 Mitty Challenge by HSR at Road Atlanta Road Course, Braselton GA.
2009 Double Drivers School by SCCA at Robeling Road, Bloomingdale GA.
2008 Time Trial by NECC at Shenandoah Track, Summit Point WV. 2008 Time Trial School by SCCA at Talladega GP Raceway, Oxford AL. 2007 Auto Cross by NECC at Corvair Convention, Sterling Heights- Detroit MI. 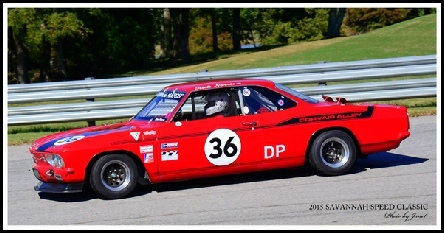 Listed are the track events that I participated in with this car, it is now racing overseas with the new owner. Following is the list of events I participated in with the newest race Covair, that arrived at Corvair Alley January 24, 2015. Prepared for racing and competed the first time November 2015 at Hutchinson Island, Savannah GA.